This is the fifth in this series of 26 posts, one for each letter of the alphabet, that I am writing during the Blogging from A to Z Challenge, April 2016. You can find all the posts, as they are published throughout the month, by following the A-to-Z April 2016 tag. I have trained with many students and instructors from a variety of lineages, and read or listened to many more. Each one sees Aikido from a different perspective. For one, Aikido might be primarily a tool for defending one’s self from muggers and rapists. For another, the purpose of Aikido is to protect all beings For yet another, Aikido is a moving form of meditation, cultivating our presence and attention. Sometimes you’ll find that people can get stuck in one of these views, as sure as can be that theirs is the correct interpretation of Aikido. In my experience, each of these perspectives can be valid in its own way, and can contribute to a more complete understanding of the whole. Although Aikido people generally are open-minded and accepting of a wide range of ideas, it’s surprising how testy these debates can get. One side is positive the other’s approach to teaching or training will destroy the art with their new ideas. The other equally certain that the first is misguided in their dedication to the preserving the past, as though Aikido were a museum piece. You will hear some claiming that another’s Aikido would not work in a street fight, while the other feels the first is totally missing the point of O Sensei’s spiritual intent for the art. There are even schools that participate in competition, something the founder explicitly denounced, but their reasoning for it seems to be well intended. And of course there are many who condemn this competition as contrary to the central principles of Aikido. Have you heard the story of the Blind Men and the Elephant? In this tale a group of blind men examines an elephant by feeling it with their hands. Each one is feeling a different part, and comes to a very different conclusion about what this thing called an “elephant” might be. The man feeling the elephant’s sturdy, upright leg declares that an elephant is like a tree. The one at the tail end is sure an elephant is like a rope. Another, feeling the trunk, is convinced that an elephant must be something like a large snake. One man, feeling a tusk, is certain the others have lost their minds, because an elephant is obviously nothing like a tree, rope, or snake, but is more like a spear, long and sharp. Still another, feeling the elephant’s broad, flat side can tell, plain as day, that an elephant is most definitely like a wall. The poor guy feeling the elephant’s thin, flat, gently flapping ear can’t understand what his friends must be thinking, because surely it should be obvious to anyone that an elephant is like a fan. Their different experiences have lead them to apparently conflicting views on what an elephant is. They are each wrong, but together they are right. An elephant is indeed like all these things. The perceptions are not exclusive – together they make up a more complete impression of the whole elephant. Aikido is like this. 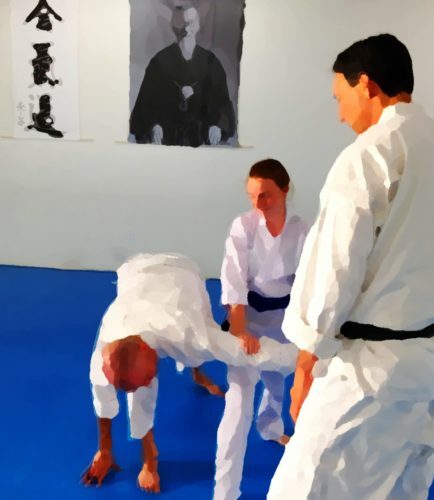 The different perspectives – seeing Aikido as anything from a fun, healthful physical activity, to a serious martial art with devastating power, to a practice of peace that can unite humanity – are all right. Aikido is an effective martial art for protecting one’s self and others – including the attacker. Aikido is physically challenging – developing strength, balance, posture, flexibility, and endurance. Aikido is moving meditation – a practice in being aware and awake. Aikido is the continuous pursuit of mastery. Aikido is a way to examine how we interact with others. Aikido is a means of developing ourselves. Aikido is fun, exciting, rough-and-tumble play. Aikido is a worldwide community of friends and teachers. Aikido is a healthful practice that promotes fitness, and mental well-being. Aikido is learning how to fall safely, minimizing risk of injury throughout life. Aikido is helpful in recovering from past trauma / PTSD. Aikido is useful in law enforcement, health care, and mental health contexts. Aikido is the embodiment of principles of non-competition, non-resistance, and compassion. Aikido is learning to be comfortable with conflict, and to resolve it without violence. Aikido is great for kids, seniors, young people, and middle-aged, tall or short, big or small, fit or not. It is important to remember that these perspectives are not exclusive. Aikido is a philosophical practice, and a fun way to stay fit. Aikido is an authentic martial art with deep roots, and a great way to meet nice people. Aikido is a mirror in which we can see ourselves more clearly, and a system of joint locks and pins. Which Aikido is right for you? If you are thinking of finding a dojo and training in Aikido, you will see that different teachers emphasize different perspectives. So how do you choose the right school or teacher for you? I would not say that you should look for a teacher who focuses on what you think you want to learn. Frankly, as a new student you don’t know yet what is really available to you. What I have gotten out of my training so far is much broader than what brought me into the dojo at the beginning. What is important is to find a teacher and a dojo community you can trust. One with solid technical proficiency, knowledge of the philosophical side of the art, an open mind, and a good heart. Train for a few years, at least, and then you will begin to see the bigger picture of what Aikido has to offer you.